Kwabena Darko is the founder of Darko Farms & Co. and Director of the Bank of Ghana. Kwabena received a microfinance loan 45 years ago. Over time, he parlayed that loan into one of the most successful private enterprises in Ghana. 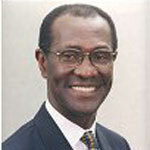 Since 2001, he has served as a Director of the Bank of Ghana, the nation’s central bank. As founding chair of both of Opportunity International’s microfinance entities in Ghana, he has helped over 100,000 Ghanaians work their way out of poverty in the name of Jesus. He was chair of Opportunity International’s Global Network from 1997 to 1998. Kwabena founded and presides over a 600-member Christian church in Kumasi, Ghana. He holds a Diploma in Poultry Science from the Rupin Institute, Israel, and an honorary Doctorate from Kwame Nkrumah University of Science and Technology, Ghana.